Tivoli Audio downsizes to create its Model 10+ table radio | What Hi-Fi? On sale next month from Tivoli Audio is the company's smallest ever table radio, the Model 10+, said to deliver 'a big, room-filling sound from its beautifully compact furniture grade wood cabinet'. Standing just 21cm tall, the new mains-powered model receives DAB, DAB+, the DMB system used in some part of Europe and FM with RDS. As well as playing through its internal 8cm speaker, which is tuned with a port, it can be used with an external Model 10 Speaker to deliver music in stereo. Control is via a top-mounted rotary dial or the remote handset, and the Tivoli offers five station presets, equalisation covering bass, treble, loudness and balance, and dual alarms allowing offering tone or radio wake-up, and snooze and sleep functions. The display screen has an adjustable backlight, the clock maintains the time even during power cuts, and there's an auxiliary input for portable players. 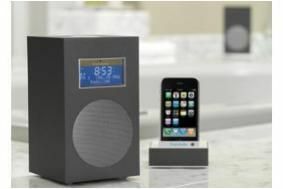 The radio will sell for around £219, with the matching speaker from about £70. Both are available in a choice of furniture-grade finishes: Aluminium Dark, Lines, Polar White or Walnut. The optional Connector dock for iPods and iPhones will sell for £95, and is available in Aluminium Dark, Polar White or Walnut.